It’s time to say goodbye to the hot weather and embrace the chill! The Sleep Coach Cheryl Fingleson, shares her top tips for choosing comfortable winter sleepwear for babies and kids. Changing autumn temperatures can make choosing the right sleepwear a bit of a challenge. As the nights get cooler, wrapping your child up in their winter PJs and adding an extra blanket to the bed seems like the obvious next step, but kids can get too hot very fast. Helping them get a healthy night’s sleep means choosing the right clothes and layers, and monitoring the temperatures. Think of how you go to bed at night, then add one extra layer for your children. If you want to make certain that your newborn sleeps warmly, swaddling is great option, but you don’t want your little one to be sweaty and uncomfortable. A sound sleep strategy during cool weather is a onesie under the swaddle, and appropriate layering on top. Place your baby on their back in the cot and make sure their face and head remain uncovered during sleep. For small children who are not quite ready for a full blanket, a long-sleeved T-shirt, a onesie with socks or a footed onesie works well under a heavy-weighted sleeping bag. There are various weights and styles of sleeping bags available and some sleeping bags have long sleeves and a zipper at the front, others leave baby’s arms uncovered, so choose wisely for the temperature you’ll be in. During frigid temperatures, dressing babies and toddlers in footed pajamas with a sleeping bag is a wonderful way to keep them cosy. As children grow, their sleep experience can change. For instance, toddlers who are too warm at night may be prone to night terrors. You want them to be comfortably warm to the touch. Remember that even when they begin talking, expressing their reasons for waking may be difficult. You may have to play detective to discover their sleep needs. Remember not to worry if your baby’s hands and feet feel cool, this is normal. The best way to judge your little one’s temperature is by feeling their chest, back or tummy. If they feel warm there, all is good. Always check the temperature of the room your baby is sleeping in, and remember there is usually a drop in temperature during the night and early morning. A sleeping bag with a fitted neck and armholes but NO hood is the safest. A sleeping bag is better than using a blanket which can move over your toddler’s head, or be kicked off. The goal to a good night’s sleep for young children during cooler weather is comfort and consistency. Age-appropriate clothing strategies go a long way to keeping baby comfy even when temperatures sway a few degrees during the night. FLANNEL is a loosely knit fabric typically made from wool, cotton, or synthetic fibers (bedding and sleepwear is usually made of cotton flannel). It is known for its softness, warmth, and affordability. 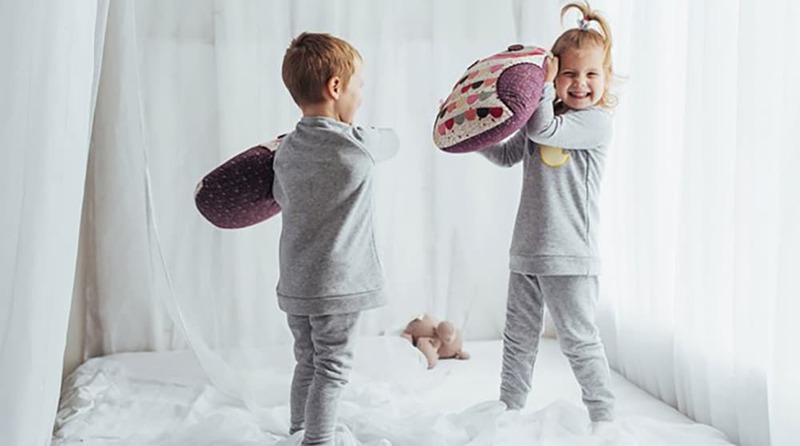 Find sleepwear that is comfortable for your child – a little loose rather than tight-fitting, with no buttons, tags or binding that may irritate them during the night. For kids who get very cold feet, lightweight socks are a great option, but remember if their feet are too warm, it can cause their entire body to overheat, and wake up. The Sleep Coach Cheryl Fingleson works with families across a range of areas, including settling and sleep techniques, establishing a good routine, discipline in the home, transition from cot to bed, potty training, safe co-sleeping, and identifying signs of postpartum depression.